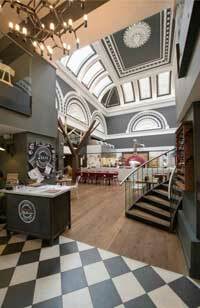 As part of the £45 million regeneration of Edinburgh’s Advocates Close, located in the heart of the old town, a UNESCO world heritage site dating back to the 15th Century, Turret Developments Scotland Ltd completed a fit out of developers’ shell to create a unique Zizzi restaurant complete with outdoor courtyard for al fresco aperitifs. Inside; stone walls are blended with design aspects inspired by the opulent Law courts, Advocate’s Library and the historical presence of the ‘Close’ offering an elegant and stylish dining experience with amazing views across to Princess Street Gardens. Turret Developments Scotland Ltd completed an internal fit-out of a new retail outlet, part of Dobbies Garden World at Melville, Lasswade, to form a state of the art independent bicycle shop. Dedicated bike fit and workshop areas were formed, complete mechanical and electrical installations including fire alarms and data were undertaken and decoration works incorporating the company’s branding were carried out. Bespoke sales desks and timber internally illuminated product display units with glass doors and shelves were manufactured..
Turret Developments Scotland Ltd facilitated in bringing beautiful pizza and restaurant design to Morningside, this PizzaExpress eatery housed in the former Braid Church, a majestic sandstone building with a grand pillared entrance. The preserved architectural heritage of the domed ceiling, Venetian windows and curved timber gallery creates a decorative setting with a unique ambience. Celebrating the work of local author, the late Muriel Spark and her most famous novel The Prime of Miss Jean Brodie, which was partly set in Morningside, quotes from the book punctuate the walls while the church’s original striking 25 foot organ remains as a focal point for customers. A decorative floor tile feature has been installed down the centre of the restaurant leading to the open plan central ‘theatre’ kitchen with its carrara marble pizzaiola top and LED back lit octagonal laser cut glass façade, creating centre stage for the pizzaiolas to perform culinary feats whilst diners can watch on from the dining space which has been smartly furnished with green leather banquette seating. Full refurbishment of an iconic Grade ‘A’ listed former bank building located right in the heart of Royal Exchange Square, Glasgow, transforming it into the most prominent Zizzi restaurant within the Group. 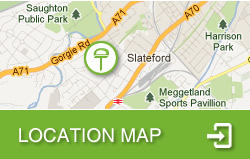 The accommodation is spread over three floors including restaurant areas, theatre kitchen and ancillary areas. The project scope included enabling works to form a shell unit, structural works to create a new escape stair through all three floors, new feature opening within the first floor, manufacture and installation of a new feature glass and stainless steel helical staircase and the implementation of an extensive fit-out to form a lively Italian restaurant incorporating the first in-house Zizzi bar. 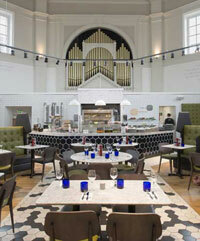 The restaurant makes the most of the building’s stunning historical architecture and taking inspiration from The Glasgow School of Art, Zizzi Royal Exchange Square is a unique eatery filled with quirky artwork. Modifications to shopfront and the fit-out of a developers’ shell located just a short walk from the pier to form a pizza restaurant with a large heated al fresco area. To help set the tone for this casual restaurant the designer used compositional elements of exposed concrete along side fine white oak detailing on counters and waiter stations. The bespoke white oak fronted pizzaiola counter with carrara marble top is defined with an illuminated ceiling making it “centre stage”. The surrounding area influenced the palette of materials and colours used. 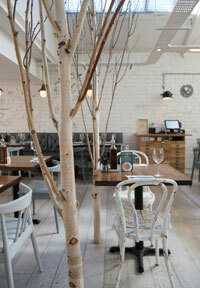 A photographer was commissioned to create individual photographs of the local area to be displayed in the restaurant. 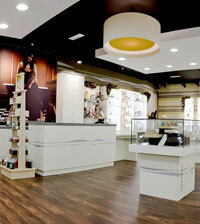 Fit-out of a retail unit located within a shopping centre in the heart of Stirling, to form a designer jewellery store. Works included both mechanical and electrical installations including modifications to fire safety systems and the formation of ceiling features. Bespoke glass and timber mid-floor and wall merchandise display units and a cash desk complete with a grey Corian top was manufactured. Statement wall coverings along with large feature lampshades were also installed. The Ortak brand was incorporated within the store by the use of large graphic imagery and the influence of the Orkney landscape, where the brand has it’s roots, can be seen in the rolling hills motif used throughout the store. Turret Developments Scotland Ltd undertook refurbishment works to both the exterior and interior of a two storey listed building with the oldest shopfront on Saddler Street, which leads to the Cathedral. Durham is rich with history and this has been captured in this restaurant. The restaurant features illustrations of Durham’s stunning Cathedral painted on to a glass frame - a modern interpretation of the Cathedral’s stained glass is wrapped around the newly fabricated steel staircase. LED rods illuminate the highly detailed roof, wooden wall panelling, and the grand chandeliers (both vintage and modern) ensures this building achieves the difficult task of being both historical and cutting edge. Following a £7.5 million refurbishment of the prestigious Princes Square boutique shopping centre, this stunning former 19th Century Merchants Square converted to provide 4 floors of premium retail/restaurants within the heart of Glasgow’s prime shopping location of Buchanan Street, Turret Developments Scotland Ltd completed a fit out of a retail unit at courtyard level to create a PizzaExpress restaurant wowing customers with a brand new restaurant experience focusing on culinary delights, great service, modern design and comfort. With seating inside and also external seating in the atrium/courtyard area the customer can choose to dine inside the cosmopolitan restaurant or people watch on tables amid the hustle and bustle of shoppers. The design concept for this restaurant fit-out took its inspiration from Glasgow’s rich cinematic architectural history. The formation of a carrara fronted pizzaiola counter created PizzaExpress’s signature open kitchen feature so customers can enjoy the theatre of watching their food being freshly prepared by a team of experienced pizzaiolos. Leather upholstered booth seating and sound absorbing acoustic feature ceiling panels were installed to enhance the dining experience. Bespoke stainless steel and glass bar display shelving units, stainless steel bar cabinetry and walnut waiter stations with carrara marble tops were also manufactured and installed. PizzaExpress Princes Square is one of Scotland’s unique dining experiences, a fashionable place to meet for any occasion. Internal fit-out of developers’ shell to form an independent award winning farm shop which offers the finest foods of Scotland by promoting local produce from the Hopetoun Estate and Scottish suppliers. Works undertaken included the bespoke manufacturing of produce displays and shopfittings, installation of lighting & sound system, decoration works and tiling works. Refurbishment of a former bar to create an individual and distinctive restaurant, whilst being clearly recognisable as part of the Zizzi brand. Home to the Glasgow school of Art, the designers were drawn to the idea of creating a space that would evoke an artist’s studio. The interior was completely stripped back to the original shell in order to start again with a blank canvas. The exposed brick walls were white washed and the original double pitched roof, which was previously concealed, was opened up to allow light to flood in and help to create a light studio feel. Plumbing and drainage installations were carried out along with decoration works, tiling works and the installation of floor finishes throughout. A bespoke pizzaiola counter, bar counter and waiter stations were manufactured. Product display shelving and a steel butchers rail installed above the pizzaiola counter were used to create colourful focal points. Turret Developments Scotland Ltd carried out a complete building refurbishment and internal fit-out, including major structural works and the installation of a new shopfront, to an existing retail unit located in the heart of Ennis, to form a relaxed pizza restaurant amidst the hustle and bustle of this lively town. In the design of this restaurant, aspects unique to the local area have been picked up on such as the formation of the chefs’ counter constructed from Liscannor stone, which creates a focal point in the restaurant. 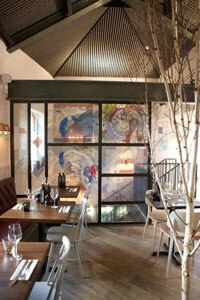 Diners also get a sense of the nearby Burren through the use of cut-slate work throughout the restaurant. 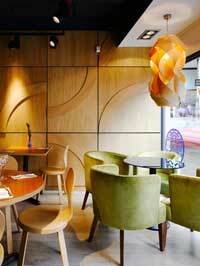 Oak cnc routered panels dress the walls creating a warm atmosphere. Full interior fit-out of developers’ shell part of a newly formed building situated on the corner of George IV Bridge & Victoria Street in the heart of Edinburgh’s historic Old Town, creating a pizza restaurant offering delicious Italian food in a bright modern ambience. 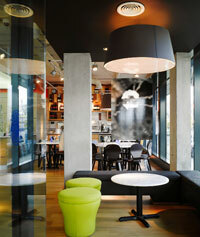 This restaurant has a distinctive look and feel created through colour tone and local ‘story’ themes. Commissioned and exhibited on one of the restaurant walls is an impressive 3D geographical map of the Edinburgh’s dramatic landscape. 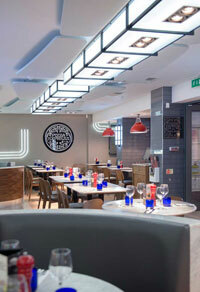 One of several bespoke feature lights installed, is a stunning blue LED fitting which illuminates the feature glass wall behind the marble clad pizzaiola counter, creating PizzaExpress’s signature ‘open kitchen’ allowing diners to watch their food being freshly prepared whilst sitting at one of the custom built high-level walnut dining tables with contemporary absoluto granite tops. Turret Developments Scotland Ltd manufactured bespoke walnut bedroom furniture to Clients’ specification and dark grey slate tiles were installed to create a feature wall within the master en-suite bathroom.